We are also hoping to see some long-awaited Census (Data Feeds) updates which should appeal to Questaholics who miss Fluffy.dk. This whole “Weekly Feature” has descended from comedy through farce to derision for me. Why do you think that and what do you propose they should do instead? Just kill off the idea of Weekly Updates. Right now, they’re grasping at straws to come up with things to call a Weekly Update item. 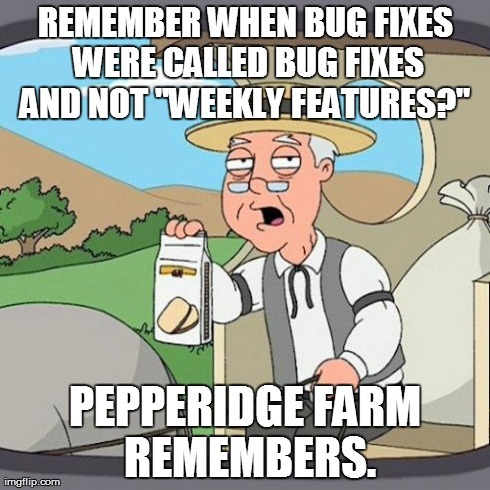 I `100% agree, sad but we should never call bug fixes a weekly update feature. I think they should give up this idea of weekly updates as were getting nothing. It is no wonder the population continues to drop. Toutefois ces “fixes” aurait dû être fait deux ans auparavant! Si ce n’est encore plus tôt, lorsque ces problèmes sont survenus. Ceux qui se souviennent de l’update Vélious avec la map coldains vs kromzek ne sont pas prêt d’oublier le “coup mortel” infligé par SOE à sa communauté Battleground. Précisément, la mort de cette communauté. Et oui, SOE, lorsque vou merdez les joueurs s’en souviennent. However, these “fixed” should have been done two years ago! If not even earlier, when these problems occurred. Those who remember the Velious update with map coldains vs kromzek are not ready to forget the “mortal blow” inflicted by SOE in its Battleground community. Specifically, the death of this community. And yes, SOE, when vou screw up, players remember. I may sound a bit harsh, and my english is not that good sorry about that. This was a complete failure the first time. The product (correctly) did nothing. Though instead of Tinkering skills, it used Geocraft skills. It gave Tradeskill XP (if you were low enough that level one recipes give XP). I’m glad it’s fixed, but how did this slip through? after hearing how many items were needed to get garbage I didn’t even bother. Waste of my time to even zone over there. So … when did they add Mount Adornments and Mount Armor to EQ2Players under Items? They realllllly had my hopes up we could add wings to old land mounts, leapers and gliders. :\ I get the feeling it was one of those things some one was working on, and isn’t working with SOE, or got shuffled off to another project, something like that. The fields have been there at least a year. I asked the EQ2 team about this and was told that mount adornments and mount armor is something the designers talked about but never went beyond the concept stage with. Not sure why EQ2Players shows it, but EQ2U and DA omit these fields. @Vapurs, those slots for mounts have been there for quite a while, since the first time I used the data about a year (or more) ago. I’ve never seen anything that USES the slots, however. Call the code changes what you want, at least they haven’t put eq2 into maintenance mode where no new features are planned and bug fixes generally just remove content. I’m amazed they put any time at all into fixing the stuff that doesn’t impact a decent amount of players or current content. I often wonder if they could fix more core and engine troubles if they did a partial ‘reboot’ of content. The end of ages nears and the meek shall fall! Any non 92+ gear and toons are reset to start in a new world. Even the powerful are scarred with many artefacts reformed from the ash of oblivion or banished without a trace. A golden path arises filled with new challenges and economies. Most of the Norrath that was is little more than a passing sense of familiarity with only the Spirit realms to remember; time’s threads are cut and history is rewritten. There wouldn’t be a place that could hold the tears and cries of people, but I’d be kinda cool if they brought enough of a refresh. One server, seamless zones, consistent itemization, new aa system that allows swapping between subclasses, refreshed faster engine, better scaling (I.e. no raid lag), mounted combat, etc. Sorry… I’m on the train and daydreamed a bit. I like the general shape of your dreaming. I would extend it a little further and fold EQ1 in at the same time. Say based on SOE’s new engine. I know lets call it EQ2.5. Oh wait, Georgeson already squashed that one. Ragnarok online had a “Transcending” system where you reached the max level (lvl 99 for them) and you could stay there, or start over at lvl 1 for better stats, better skills, etc… The levels went a lot slower the second time around though. That would certainly breath new life into old zones… >.> and make grouping more possible for new players if there are some that don’t just grind back up to max level… if….if…. Afterthought: If Star Trek can get away with it, why not EQ2? Final Fantasy got away with it too.. kinda.. and seems to be all the better for it. 🙂 but no telling how many subs they lost in the process. i mean, you know, besides mine. Final Fantasy just screwed up so badly they remade the game and apologized to people. Took balls to do that though. FF14 needed to rewritten from the ground up. It was totally unviable as an MMO and lacked basic functionality present in EQ1 10 years ago.